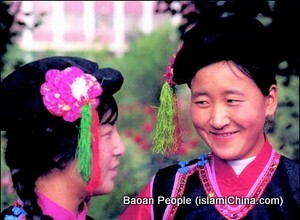 The Bonan is one of China's smallest ethnic minorities, with only 11,700 people. Its language belongs to the Mongolian branch of the Altaic language family and is close to that of the Tu and Dongxiang ethnic minorities. Due to long years of contacts and exchanges with the neighboring Han and Hui people, the Bonan people have borrowed quite a number of words from the Han language. The Han language is accepted as the common written language among the Bonans. 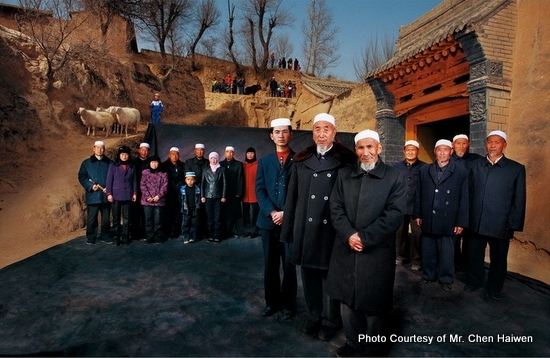 Judging from their legends, language features and customs, many of which were identical with those of the Mongolians, the Bonan minority seems to have taken shape after many years of interchanges during the Yuan and Ming (1271-1644) periods between Islamic Mongolians who settled down as garrison troops in Qinghai's Tongren County, and the neighboring Hui, Han, Tibetan and Tu people. The Bonans used to live in three major villages in the Baoan region, situated along the banks of the Longwu River within the boundaries of Tongren County. During the early years of the reign of Qing Emperor Tongzhi (1862-1874), they fled from the oppression of the feudal serf owners of the local Lamaist Longwu Monastery. After staying for a few years in Xunhua, they moved on into Gansu Province and finally settled down at the foot of Jishi Mountain in Dahejia and Liuji, Linxia County. Incidentally, they again formed themselves into three villages -- Dadun, Ganmei and Gaoli -- which they referred to as the "tripartite village of Baoan" in remembrance of their roots. Dahejia in western Linxia County is the place where the Bonans mainly concentrated. The area is thickly wooded and enjoys a moderate temperature supported by plenty of water and lush grass, which make it suitable for farming and stockbreeding. However, until the mid-20th century, under the heavy burden of feudal oppression and exploitation, the place had been bleak and desolate. In Dahejia, Bonan and Hui bureaucrats, landlords and religious leaders owned large tracts of farmland, forests and orchards. They also monopolized the river transport and owned 20 of the 27 water mills. The majority of the people were reduced to tenants toiling under the severe exploitation of land rents and usury. Rent in kind was a form of exploitation widely practiced in the area. In most cases, rentals were as high as 50 per cent. Exploitation by the landlords also took on other forms such as hiring farm labourers on a long-term basis and trading in slave girls.